One of the raunchiest card games out there is called Cards Against Humanity. It’s essentially an adult version of Apples to Apples. Each round someone draws a card with a sentence with a blank in it. In each player’s hand are nouns of varying degrees of lewdness. Each player plays a card and one picks the best response–best meaning the most meaningful or the laugh-out-loud grossest. It is fun I hear it is fun. Turns out: other people had the same idea. And there’s now an Indiegogo campaign (like Kickstarter) to get it published. 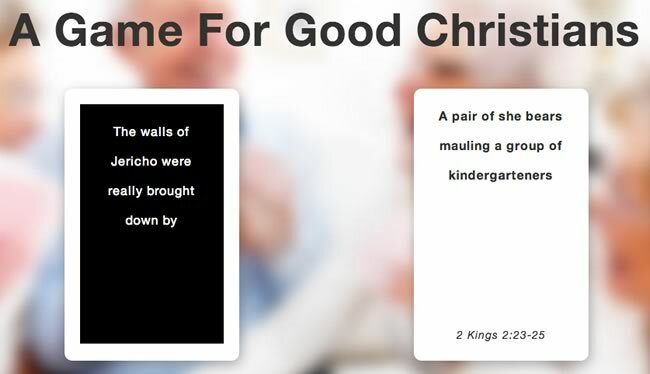 This game was developed after years of encouraging our friends and family to “dig deeper” into what the text of the Bible means, and many irreverent and deeply theological conversations. We’ve created and printed multiple mock versions of the game, which we piloted with friends and family, clergy and lay people, and people all over the spectrum of belief and lack thereof. Based on the feedback we feel it is now time to focus our efforts to bring this game to a larger audience, so we are launching this project to raise the $8,000 we need to cover our first print run of the game and bring all this awesomeness to you. If you want to own a copy this game, please help us reach our goal, or all this Biblical goodness will pass away. If this game makes you worry for your immortal soul, just remember: we love the Bible, we just have a funny way of showing It. As of this writing, these folks are at about $800 out of the $8000 they are hoping to raise to make this project a reality. If you have a twisted sense of humor, or you are a campus minister (kinda redundant…), or you want people to understand what is really in the Bible, then consider supporting this project. I also think there’s a whole ton of hilarious nouns/situations that are IN THE BIBLE and that these folks might want to consider for a future expansion. Here’s a few from my list, you can add your own (these are shamelessly taken from a group Google Document that a few friends have been kicking around for a similar project). You see? The Bible is a fantastic source for all manner of odd–and yet deeply human–situations, and I’m confident that a game like this will go over well in many circles. So give it a boost at Indiegogo, and follow along on Facebook, Tumblr and Twitter with these folks. Best of luck to them…they’ll need it where they are likely going. You know, the fact that UMJeremy finds taking the Bible out of context, in a manner even more deplorable than that outlined by St. Iraeneus in Against Heresies, is really disturbing. At least the Gnostics and Marcionists were trying to reconstruct the Holy Scriptures in order to make a theological point, whereas here, UMJeremy is just taking verses out of context in order to make fun of this. Jeremy, do you really believe in Christ? Have you really encountered His saving grace? Do you not understand how offensive this is to people? I just randomly encountered this while looking up another post of mine I want to cross reference in my set of polemics, and I just feel nauseated at this point frankly; I had thought you were just a misguided liberal pastor, laboring under the delusion of process theology, but with a good understanding of the sacraments at least, but this is just absolutely vile. Really quite beyond the pale; I think you ought to retract this.